Photo from a 1978 Lagoon brochure. In 1988, Pioneer Village celebrated its Jubilee year with a week full of music, contests and demonstrations from pioneer life. 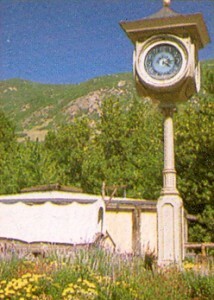 Although Pioneer Village opened at Lagoon in 1976, it originally opened in Salt Lake City in 1938 by Horace Sorenson, owner of the old Southeast Furniture store who had amassed a large collection of pioneer artifacts. The Jubilee coincided with Pioneer Day and included demonstrations of “bead work, hide tanning, boot making, weaving, spinning, basket making, braiding, sand sculpture, paper cutting and many other crafts” according to the Deseret News, who sponsored the event along with KSL & KUTV. 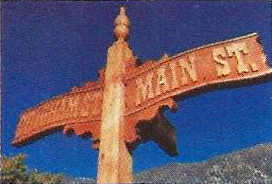 Entertainment was provided from noon to 9pm every day on the Village Green Stage – a former venue north of Carriage Hall which featured many country musicians in the 1970s and ’80s. “Oldtimers” dressed in clothing of the 1880s would also wander the area and interact with guests. Watermelon and pie eating contests with “valuable prizes” were also held each day and there were pig races around the street clock at the south end of Main Street. Deseret News, 11 Jul 1988. Life in the old West being revived in Pioneer Village Jubilee. Deseret News, 19 Jul 1988.